IvanView - View, Browse, Edit and Convert Digital Images. IvanView Image Viewer Browser Editor Converter is capable of viewing more 60 image formats and has unsurpassed conversion capabilities in 15 of the most popular formats. Vista Start Menu was specifically designed to replace the often confusing menu in Windows XP and Windows Vista. For your convenience, the interface has been developed with human psychology taken into account. Solve tasks in a simpler and quicker way. Vista Start Menu offers many new features not available in the system Start menu. You can start a program or open a document in a couple of keystrokes, without having to take your hands away from the keyboard. Easy-to-use zooming allows those with large monitors and people with poor eyesight to work with comfort. If you have many programs, they will all fit onto the screen because you will be able to stretch the Start menu and resize it any way you like. Vista Start Menu supports tabs and each menu item can contain any number of them. Start searching the Internet or your local computer right from the Start menu with just one keystroke. Those who use the extended version will also be able to use the features of one-click launch and quick un-install. Start working with pleasure! 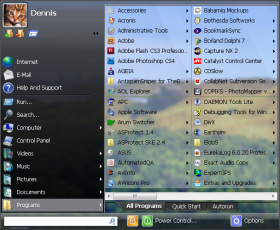 Aha-soft IconXP allows you to edit icons and customize the Windows desktop appearance. It supports the new icon format introduced in Windows XP (employs smooth transparency and other visual effects). Using this program you can create and edit icons in either standard or custom sizes, with color depths up to 32-bit True Color with 8-bit alpha channel. Paint tools include: color replacer, color selector, spray can, pencil, brush, flood fill, text tool, line tool, rectangle, curve, ellipse, 3d frame. Modifiers can also be used to apply color gradients and chess fills. For Windows XP icons, you get to add cool drop shadow and smooth effects. IconXP supports .ico, .ani, .cur, .wmf, .emf, .bmp, .jpg, .jpeg, .gif, .png, .xpm, .xbm, .wbmp, Mac OS icons and Adobe Photoshop .psd file formats. You can import images from screen captures. IconXP allows you to import, export and change color palettes for icon images. IconXP allows you to change standard Windows icons, folder icons and customize desktop attributes. You can easily replace, colorize and save the icons Windows uses to display various objects - My Computer, Recycle Bin, Internet, Start menu items, drives, system folders and your own folders. You can also hide or change shortcut overlays. There are also commands that change the desktop icons size and color resolution, and rebuild the icon cache. Talisman Desktop is a desktop manager and shell-replacement for Windows 9x/ME and NT/2000/XP/Vista. The program lets users design their own desktops and interfaces or choose from hundreds of downloadable themes, which work either atop or as complete replacements for the default Windows shell. 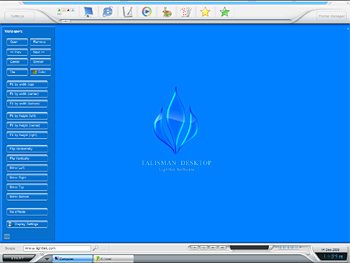 Unlike Windows XP themes, Talisman Desktop lets you completely customize the Windows interface. Its power extends from adding new toolbars to designing a brand-new desktop with any combination of drop-down menus, buttons and panels. The program allows any number of fixed or free-moving icons, buttons, or other objects that launch programs, Web sites, or internal shell commands; HTML and Flash objects; a customizable taskbar, system tray, calendar, clock; and customizable Start, folder, and task menus, as well as a powerful script language and plugins. Originally created for home users who enjoy outdoing the Mac OS or "Longhorn" designers, Talisman has also been adopted as a front-end interface for public and corporate PCs and kiosks. Currently, there are over 1000 customizable themes (interfaces) that can be used for personal PCs, standardized corporate desktops, car PCs, Home Theater and MediaCenter interfaces, touch-screen computers, protected interfaces for museums, libraries and other organization. For human readable information, both digital and analog display methods can be useful. For instant information at-a-glance, analog meters are often superior. Many people glance quickly at their analog watch and immediately know roughly what the time is. Analog Clock is an analog, skinnable, Windows tray clock replacement. The careful study of the shape and proportion of the numbers, the thickness of the screen-printing, and the color of the background all ensure instant readability from various distances and angles. Analog Clock is perfect for both your office desktop as well as your home PC. Analog Clock is available with several skins that resemble the look and feel of the standard XP visual styles. Skins are tunable. You can switch on or off some of the interface elements, such as the second hand, for example. Analog Clock is an NTP-enabled application. It will update your system clock time, synchronizing it with atomic clocks through the Internet. In addition, the program shows a skinnable quick calendar window. (Just move your mouse over the Analog Clock display.) In the era of robotic Mars explorations, humans still prefer more human-oriented devices on Earth! Use analog clocks, and leave the digits to robots! Convenient alternative to the Start menu.